Caption slip reads: "Photographer: Mack. Date: 1956-05-03. Reporter: Kline. Assignment: hospital disaster planning. Special Instructions: Negatives to Riblett. 21-22: Nurses at California Hospital operating communications network, helping young man seeking word about his wife. 17-18: Taking victims out of ambulance at California. 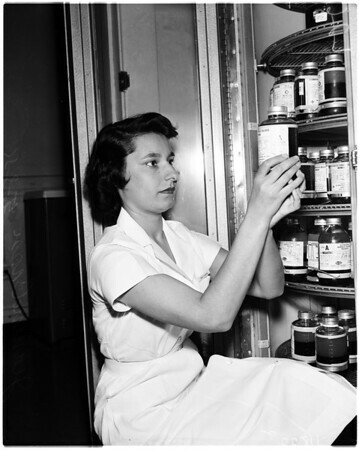 25-26: Nurse Jeanine Grossi checks bottles of plasma in California blood bank. 29-30: Nurses and patients at emergency admitting room at Queen of Angels, first stop for victims. Is converted auditorium. 7-8: Patients in surgery at Queen of Angels. 55-56: Disaster victims line hospital corridors at Queen of Angels. 9-10: Nurses and victims in morgue at Queen of Angels. Is converted garage".